From time immemorial, minerals have fascinated mankind because of the magic and emotion they impart. 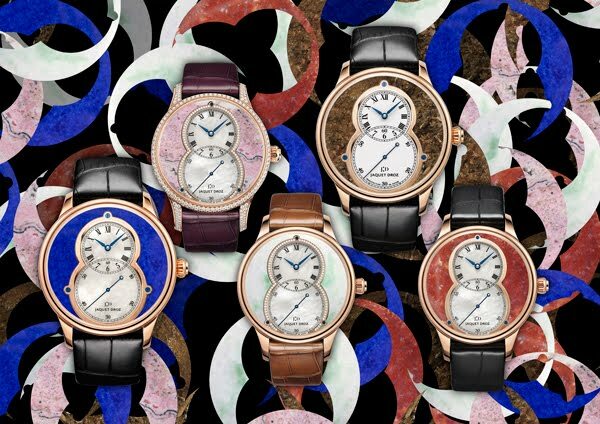 In honor of this endeavor, begun at the dawn of time, Jaquet Droz has fashioned inimitable watch dials from noble materials, treasures drawn from the depths of the Earth and from outer space. Gemologists of the brand search constantly for the rarest stones which will elevate the beauty of unique pieces, and which will reflect the choice and personality of the client. A block of stone might yield only one dial, or sometimes none at all. The crystals must be hard and scratch-resistant, able to withstand frequent handling without being damaged. The master craftsman calls upon all his art and the excellence of his skill for the presentation of these prodigious minerals. The greatest challenge is to find the right orientation so that the materials are cut whilst respecting the very nature of the stone. Master stone cutters and dial makers work on gemstones: Lapis Lazuli, Astorite, Jadeite, Bronzite, Red Moss Agathe, aso. They adopt a different approach for each mineral, always taking care to respect the spirit of the stone and leave it intact. As an incarnation of exception, these models are available in limited editions, Numerus Clausus of 8, 88 or as a unique piece.